West Yellowstone Search and Rescue responded to an injured snowmobiler from Switzerland on Saturday, March 23. GPS unexpectedly complicated the issue, as the initial coordinates weren't accurate. Another 911 call originating from Idaho got Fremont SAR involved as well with wrong coordinates. Three tries later West Yellostone SAR, Gallatin County SAR, Hebgen Basin Rural Fire and Fremont County SAR found the snowmobiler and airlifted him out. Snowmobile training for Gallatin County Search and Rescue. West Yellowstone responders rescuing an injured snowmobiler on February 19. West Yellowstone Search and Rescue responding to a call for an injured snowmobiler on February 19, 2019 with help from a REACH Air Medical Services. Two years ago just before Christmas, traditionally a time for baking cookies, spending time with family and buying last-minute gifts, a group of people raced against the clock to find a lost man. The West Yellowstone Search and Rescue crew had gotten a call at 6:30 p.m. that Laurie Mann, 55, from California, had become separated while snowmobiling from his two sons a few hours before and hadn’t returned. It was already cold, around minus 13 degrees, and getting colder. A blizzard had set in. There was no visibility from the wind and snow, which added to the near-foot of powder that had fallen the day before. “We showed up breaking three-foot drifts on the trail trying to search for him," said Jeff Watt, a Search and Rescue responder. "Your headlights, you rely on those, were going into darkness quite frequently because of the snow." Mann was waist-deep in snow in an embankment. He had driven off a cornice and was trapped. He wasn’t injured — but he also wasn't equipped to spend the night. His snowmobile rested upside down atop the gully. Immobile, he waited. Because of the heavy snow, any tracks that Mann had left had disappeared, and rescuers didn't have a GPS signal for his phone, said Travis Hansen, another SAR responder. About three hours later a small group of the SAR crew stopped near the embankment. They had no clue they where anywhere near Mann. Someone noticed a flashing light refracting off the snow. Mann was intermittently activating his smartwatch as a feeble SOS call in case someone was out there. "He thought he was going to perish in the woods," Watt said. Not long after, Mann was rescued, warmed up and brought back to safety. SAR had kept him from freezing to death. The West Yellowstone Search and Rescue, part of the Gallatin County Search and Rescue, responds to more than 100 SAR missions a year. They respond to stranded hikers, injured snowmobilers and skiers caught in an avalanche. The busy team is made almost entirely of volunteers from the community. The Gallatin County SAR stays busy year-round, and is one of the busiest search and rescue teams in the state. They’re nearing the end of the first quarter of the year, and already have responded to 34 calls. Despite a high number of missions, it's nowhere near the record, Gallatin County Sheriff's Captain Jason Jarrett said. That was set in 2016 with 132 missions. The past two years have seen just more than 100 SAR missions each. SAR is a year-long operation, Jarrett said, involving 152 active volunteers and deputy coordinators, not including support staff. Volunteers get workers' compensation and are reimbursed. Their time is donated. Any other expenses like operational costs are covered by a one-mill levy specifically for SAR, and sometimes it will receive donations from the community. The busy season depends on the location. In Big Sky, skiers need help, Jarrett said. In Gallatin Valley, lost or injured hikers in the summer keep SAR busy. West Yellowstone SAR missions typically involve snowmobilers. West Yellowstone's busy season is coming to a close. It picks up around Christmastime and usually ends around March, said Jason Howell longtime SAR volunteer and West Yellowstone native. Only four of this year's 34 missions occurred in March, but all were in West Yellowstone, and they all involved snowmobiling. "We run around 100 calls a year, and West Yellowstone will do a quarter, but it’ll do it in the first three months," Jarrett said, "It all hits at once. They're out twice a day sometimes." West Yellowstone carries the hefty amount of rescues for the county and in such a short amount of time because there's so much winter recreation. Which is why SAR is so critical in small communities like West Yellowstone that rely on their tourism and outdoor recreation, said Mike Gavagan, Gallatin County Sheriff's deputy and one of two SAR coordinators for the area. West Yellowstone, a gateway to Yellowstone National Park, draws thousands of tourists a year. In the winter it's a snowmobile hotspot for locals and out-of-staters alike. Annually, 11,000 people purchase non-resident stickers to snowmobile in the area, said Seth McArthur, Montana snowmobile program manager. That doesn't include people who rent or use guided services in the area. West Yellowstone is also a popular gateway to Yellowstone National Park, which draws about 4 million tourists annually. Last year the West Entrance saw almost 2 million people funnel through it. And while SAR missions can involve locals, West Yellowstone missions tend to see a higher frequency of tourists. "For us in West Yellowstone the vast majority, and I do mean vast, are people from out of state," Gavagan said. "We rarely have rescues for locals, but it does happen sometimes." This year only one mission of the 34 incidents involved a person from Montana. West Yellowstone has a team of about 25 active volunteers, Jarrett said. Of those, about six to eight will show up for any one call. Volunteers' willingness to respond at a moment’s notice is what baffles Gavagan. Jason Howell said the hours are unpredictable. Some weeks nothing will happen. Others, he'll be out on missions multiple times. He volunteers about 20 hours a month in the winter on average, he said. He attends training sessions too, which happen a couple times a month during the winter. Travis Hansen, an SAR responder, said in his experience the average search calls this year took four to five hours. Rescues are usually faster, he said. Spending the time is worth it though, Howell said. It's a sentiment that Watt and Hansen echoed. "Because if people find themselves in a bad situation, they know they can call for help," Hansen said. "It’s that little peace of mind that can help people out." Something Jarrett says during training sessions is what motivates Watt on calls: regardless of why the person needs rescuing, if you're able to go out, do it — because someone, a mother, spouse or other family, is waiting for that person's safe return. "I’m in the backcountry quite often, and if something ever happened, it's nice to know there is a group of guys willing to put their time and life and anything else on the line," Watt said. "I’m building up my karma for the day if it does come. And more importantly, my mom would really appreciate there is someone looking for me." In the countless SAR incidents Watt has responded to in the past two decades, he’s accrued his fair share of war stories. The broken bones, scrapes and bruises and the quick rescues have blurred together, though a few memories have lasted. Those circumstances are out of the SAR team’s control, he said. But it doesn’t make it any easier. “The hardest thing was recovering bodies from avalanches,” said Howell. Howell grew up in West Yellowstone and watched his father volunteer for the West Yellowstone SAR as a young kid, so it made sense to begin volunteering himself. He started while he was in high school. Howell briefly left West Yellowstone to attend college, and later he designed snowmobiles in Minnesota. He moved back to his hometown in 2007 and has been volunteering ever since. He tries to respond to every call that comes across his pager, although they often come when it’s least convenient. “If we're available we tend to drop everything and go,” he said. The GCSAR has evolved since Howell’s father volunteered. Now the department, including the West Yellowstone and Big Sky buildings, is equipped with helicopters, GSI and GPS technology, dog teams and divers, along with snowmobiles. GPS location has made it easier to find and rescue people quickly. That includes bringing an emergency beacon, and a means of communication other than a cellphone. Often people from out of state will bring a cellphone and think they’ll be able to make calls, but as many Montanans know, it doesn’t take long to lose cell service. 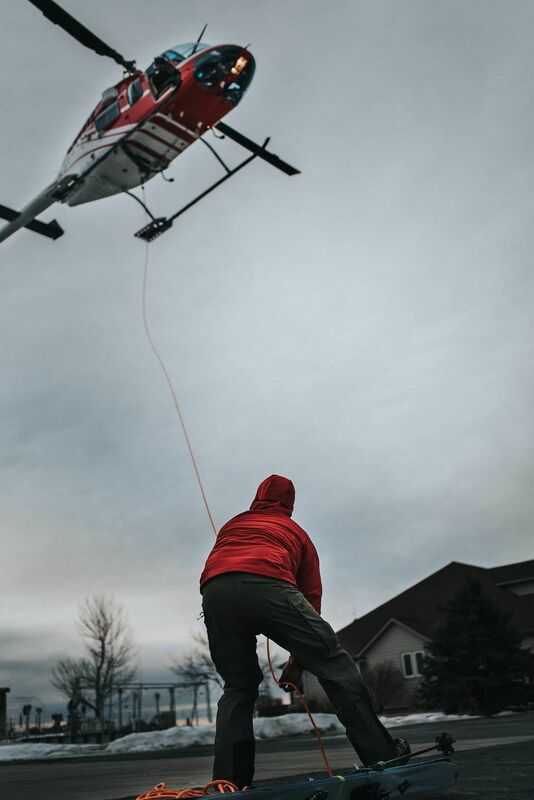 If SAR is unable to find someone’s location based on their cellphone GPS, the rescue is longer and harder. Being prepared to spend the night and taking gear like an emergency beacon, probe and a shovel could save your life, Gavagan said. This past Christmas the West Yellowstone SAR department, including Watt, were surprised with gift baskets. Mann, the California man they'd rescued the previous year, had sent gifts to everyone who was involved in his recovery. "It's really neat to see that your work isn’t going unnoticed," Watt said. "We probably saved his life, but to us it’s just what we do." That call sits in Gavagan's mind as serendipitous and "crazy rewarding." "He was able to enjoy Christmas this year, and last year and for many Christmases to come," Gavagan said. The gift baskets were a nice gesture, but the SAR team is humble. The volunteers shrug off praise, not eager to claim fame. Captain Jason Jarrett, commander of GCSAR, has other thoughts. "It’s honorable, hard work, and it is the people that absolutely deserve our admiration. They are world-class, selfless, hardworking, smart, any positive adjective you can think of, and none of them want to talk to the press," he said.